Royal Crown Club program entitles you to the below mentioned benefits and privileges at The Crown, Goa. Membership is valid for one year and the membership fee is Rs. 5000/- + taxes. 1 Complimentary night stay with a free upgrade to the River View category (subject to availability). 20% discount on Rooms Friday to Sunday. Complimentary usage of swimming pool with spouse and 2 children below 18 yrs. Why be a Royal Crown Club Member? Only one card may be presented per table/per visit. The value of the specific discount shall not include central, state, local taxes, nor on banquets or events. Members are requested to make a table reservation to ensure immediate attention on arrival. Discount on Divine Spa treatments requires a prior reservation of 24 hours. Any bookings made through Travel Agents, Corporations or any third parties are not eligible for reservations or discounts under this program. Complimentary stay should be booked at least 24 hours in advance in writing Subject to availability. No show or cancellation received less than 24 hours in advance will be treated as used and will lead to cancellation of the Complimentary stay certificate and it cannot be reused for next stay thereafter. Complimentary or discount certificate on room stay are also valid for double occupancy, with one child below 8 year. Extra Person or child will be charged as per published rates. Benefits on rooms stay under this membership will not be applicable from 22nd December to 2 January. Discounts will not be available on special promotion/programs applicable from time to time. Children above 8 years of age are included in the total guest count for the purpose of calculating discounts. All taxes as applicable and are payable. All certificates enclosed are for one time use only, must be surrendered at the time of arrival, have to be utilized in full and cannot be exchanged for cash or any other services. The benefits given in the gift certificates are governed by the terms and conditions printed on the certificate. These are valid strictly as indicated, and cannot be extended or re-validated. In the event that the certificates are lost, these cannot be replaced nor the money refunded. In the event that the certificates are lost, the same will not be replaced nor will be the value refunded. The duplicate membership card will be issued at a nominal charge of Rs. 200/-, but only after details given to hotel of the misplaced/ lost/ stolen card. All Certificates should be produced in original with seal and validity. Way To Enjoying Times at the Crown Goa! Please read individual voucher / certificates carefully for specific Terms & conditions. The membership term (validity period) shall be for a period of 12 calendar months from the date of issuance of membership. The card and the certificates have no cash value and cannot be traded in part nor redeemed in cash. The RCC Program has a membership fee of INR 5000 + taxes. The total amount of the membership fee will be refunded, provided the membership has not been used and refund is Crown Cluck requested by the Member within 15 days of acceptance of membership. The refund will only be returned after deducting the administrative and operational costs, minus the taxes after the receipt of the membership card, all the original certificate and a written cancellation request subject to management decision. Member benefits can be availed only on presentation of the Membership card. The Hotel reserves the right to deny extending benefits in the absence of membership card. No Credit Facility will be Extended on this Card. Early checks in, late check out or any specific room’s type request are subject to availability and cannot be guaranteed at the time of reservation. Cheque to be drawn in Favor of “VISION DEMPO HOSPITALITY & ESTATES PVT LTD”. RCC shall not be liable for any amount greater than the membership fee to the member as a result of his or her membership. Presentation of the relevant accommodation certificate and a valid photo ID is imperative at the Time of check in. 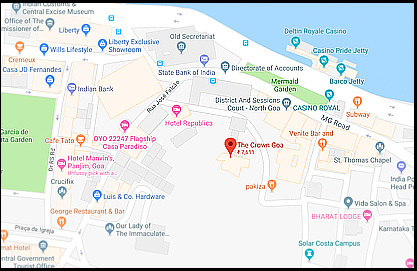 THE CROWN GOA HOTEL & SPA reserves the right to add, modify, withdraw or delete any of the benefits, rules, terms and conditions, the duration of the program, with or without prior notice. All decisions in this regard will be final and binding on the members of the program. Become a RCC member today, It’s the best way for enjoying your memorable moments with us at The Crown Goal! 2019 © The Crown Goa. All rights reserved.